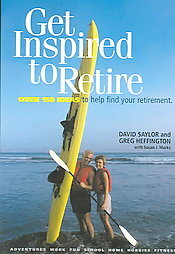 Beyond Genealogy: Get Inspired to Retire — Super Ideas! We received a letter on March 13, 2006, from Kaplan Publishing informing us that Genealogy Today was THE family history web site featured under the topic “Dig for Your Roots” (page 40) in a new book entitled, Get Inspired to Retire: Over 150 Ideas to Help Find Your Retirement. Authors David Saylor and Greg Heffington wrote, “Tracing a family genealogy is a legacy for your children, grandchildren, and great-granchildren. No matter how insignificant something sounds to you today, it may be invaluable to future generations.” Great advice! The ideas in this colorful guide will help you plan for and make the most out of your retirement.